Frances Kiernan is a printmaker, book artist, typographer and designer. 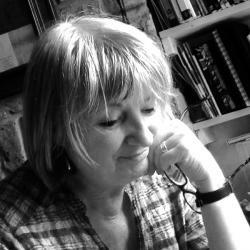 She was trained as a typographer and designer in the mid 1960s and continued to work as a designer and art director in advertising and publishing until 2002 when she returned to art school to study for an MA in fine art. As a practicing artist she exhibits regularly and her interest in community projects allows her to devise and lead workshops in making book structures and printmaking for children and adults. Frances is an associate lecturer at Chelsea College of Art and a freelance artist-educator for galleries. Her patterned papers are a recent development in her work.